VANCOUVER, British Columbia – From the Pacific coast to the shores of the Black Sea. From the peaks of western Canada to the Caucasus mountains of southern Russia. From gleaming North American skyline to palm-fringed resort in the former Soviet Union. Do svidanya (goodbye) Vancouver. Do vstretchi (see you) in Sochi. With the Vancouver Olympics now over, the focus turns across the world to Russia’s first Winter Games in 2014 – taking the Olympic movement to a new territory and a new set of challenges. The Russian city’s first big moment in the global spotlight comes during Sunday night’s closing ceremony, with the Olympic flag handed from the mayor of Vancouver to the mayor of Sochi. After the showbiz, the hard work will continue back home as organizers continue to prepare for an event that has the prestige of Russia and its leaders – including Prime Minister Vladimir Putin – on the line. Ever since Sochi was awarded the games by the International Olympic Committee three years ago, questions have been raised: Can Sochi complete its massive construction projects on time? Will the funding hold up? Will the games be safe in a city near the separatist Abkhazia region in neighboring Georgia? Putin, Russian president at the time, was instrumental in Sochi securing the games when he traveled to Guatemala City in 2007 and personally lobbied IOC members. He and current President Dmitry Medvedev remain centrally involved in making sure the games are a success. Sochi, established as a summer resort under Josef Stalin, is a city of about 500,000 people in Russia’s Krasdonar region. Olympic organizers hope the games will serve as a catalyst in turning the area into a year-round world-class destination for Russians and foreign tourists alike. Organizers say the games will feature the most compact layout in Winter Games history, with a cluster of ice arenas situated along the Black Sea coast and snow and sliding venues a half-hour away in the Krasnaya Polyana mountains. A new rail line is being built to connect the two clusters. “You can swim in the warm Sochi sea, and after 24 minutes on a train, you can change clothes and go skiing in the mountains,” Pakhomov said. 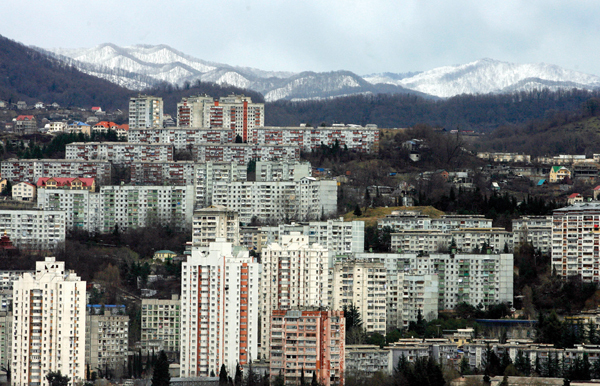 First, Sochi has to build virtually all of its Olympic facilities from scratch. “Literally from nothing,” Chernyshenko said. Sochi promises that all venues will be ready two years in advance to allow for the holding of Olympic test events. The first trial run will take place a year from now with a European Cup event in Alpine skiing. More than 70 test events are planned in 2012 and 2013. The cost of the Olympic infrastructure project is put at $7 billion. “All the money is allocated and we don’t see any risk for a shortage of finance,” said Chernyshenko, who has a separate operating budget of $1.8 billion. Russia is also spending billions more on other non-Olympic projects, including renovation of the Moscow-Sochi railway line. Despite the global economic downturn and fluctuating oil prices, Sochi has managed to raise record sponsorship revenues, surpassing $1 billion in domestic deals so far. The IOC has closely monitored Sochi’s preparations and is happy with the progress, although Jean-Claude Killy, who heads the IOC’s coordination for Sochi, has repeatedly warned there is no time to waste. The construction and design of Sochi’s boblsed and luge track will be under scrutiny following the high-speed training crash that killed Georgian luger Nodar Kumaritashvili on the day of Vancouver’s opening ceremony. IOC president Jacques Rogge has written Chernyshenko asking him to ensure the track is safe. The Russian said plans already called for the track to be 6-9 mph slower than Whistler’s. Security is also an issue on a wider front. Sochi is located in a volatile region, just north of the border with Abkhazia, where Russia has thousands of troops. Russia defied the West by recognizing Abkhazia and another separatist region, South Ossetia, as independent after its war with Georgia in 2008. Sochi brought a team of 150 observers to Vancouver to watch and learn. One key lesson so far: Have contingency plans in place for the kind of weather problems that caused havoc at the snowboard and freestyle venue at Cypress Mountain. “We are already thinking seriously about Plan B if the weather doesn’t cooperate,” Chernyshenko said, citing plans for new technology and snowmaking techniques. Another priority for Sochi is recruiting volunteers. Vancouver organizers brought in about 25,000 volunteers, who won rave reviews for their smiling hospitality. Russia doesn’t have a tradition of volunteerism, but is recruiting volunteers from all over the country. “The games are about people and the human factor,” Chernyshenko said. The biggest challenge might be in replicating the way Vancouver celebrated these games, with festive crowds in the streets and arenas packed with cheering fans. IOC officials said it’s the best Winter Olympic atmosphere since the magical 1994 Games in Lillehammer, Norway. Sochi organizers can only hope for improved performances from Russian athletes, who bombed at these games with just three golds and 15 total medals going into the final day. The Russians stood 11th in the gold-medal standings – the only time they have been out of the top five since the Soviet Union first competed in the Winter Games in 1956. Canadian athletes thrilled the host nation by winning the most gold medals in Vancouver, although the U.S. clinched the most overall medals. The Russian medal flop may account for the absence of Medvedev, who had been expected to come to Vancouver for the final days of the games. His plans apparently changed after the Russian men’s hockey team – expected to make Sunday’s final – was knocked out in the quarterfinals by Canada. Before the Olympic flag left Canada on its journey to Russia, Vancouver’s organizing committee offered a word of advice to the next hosts.